Our full-color catalogs present the newest and best-selling product we carry on topics in education including assessment, RTI, English language learners (ELLs), special education, co-teaching, professional development, lesson planning, inclusion, bullying prevention, and much more. 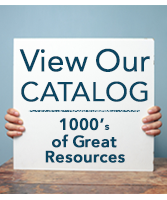 Enjoy browsing our most recent catalog. You can also request a printed catalog. To view our dedicated catalog of Famis-approved products for New York City schools, visit our New York City Schools page.